AUSTAL (ASX: ASB) today announced that its American subsidiary, Austal USA has delivered the Expeditionary Fast Transport ship, the USNS Burlington (EPF 10) to the United States Navy. This is the tenth ship delivered as part of a US$1.9 billion contract for 12 vessels and the fourth ship Austal has delivered to the Navy in 2018. 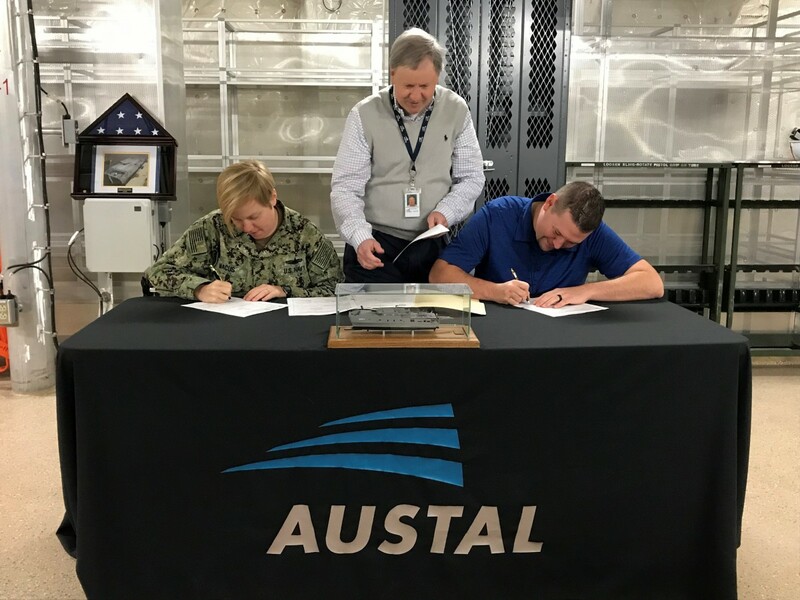 “Austal takes great pride in sending another EPF to join the Military Sealift Command (MSC) fleet. The success of this milestone achievement is a result of the dedication and hard work of the Austal team” Austal CEO, David Singleton said. The EPF program provides the Navy with a high-speed intra-theater transport capability. The 103 metre (338-foot long) Burlington is an aluminium catamaran capable of transporting 600 tons, 1,200 nautical miles at an average speed of 35 knots, and is designed to operate in austere ports and waterways, too shallow and narrow for the larger ships in the surface fleet, providing added flexibility to U.S. war fighters worldwide. The ship's flight deck can also support flight operations for a wide variety of manned and unmanned aircraft, including a CH-53 Super Stallion. Upon delivery of USNS Burlington, two additional Spearhead-class EPFs are under construction at Austal’s Mobile, Alabama shipyard. The Puerto Rico (EPF 11) launched this week and will now prepare for sea trials and Newport (EPF 12) is being erected in final assembly. Austal also recently received instruction from the Navy to order long lead-time materials for EPF 13. In addition to the EPF program, Austal is also under contract to build Independence-variant Littoral Combat Ships (LCS) for the U.S. Navy. Nine LCS have been delivered, while an additional six are in various stages of construction. Austal successfully balances commercial and defence projects and celebrates 30 years of success in 2018. Austal has designed, constructed and delivered more than 300 commercial and defence vessels for more than 100 operators in 54 countries worldwide. Austal is Australia’s largest defence exporter and the only ASX-listed shipbuilder. Austal has industry leading shipyards in Australia, the United States of America and Philippines and service centres worldwide.